In last month's edition of The Skin Diaries, I reported that I finally felt like I was seeing results, or at least I was really learning some lessons about my skin. This month? I've learnt the same lesson again, which is sugar is no good for my skin!! My skincare routine hasn't changed too dramatically, though I haven't been going as crazy with the acids, in particular the Peter Thomas Roth Max Complexion Correction Pads. They are really fab exfoliating pads, especially if you have oily skin and are acne prone as the salicylic acid works to reduce excess sebum. However I'm starting to see the pads as a once a week/fortnight skin treatment as they are so strong! Your skin really does call out for some love and attention after these. Therefore I'm a little concerned my routine of using them two/three times a week is too much, as my skin has been a little unbalanced lately. I've been focusing on really nourishing my skin with light yet harassing products like the Clarins HydraQuench Lotion (I introduced that last month), and balancing oils such as the Balance Me Radiance Face Oil. One thing I really recommend avoiding if you're acne prone is focusing on skincare solely for acne. It's best to cleanse your skin with a nourishing cleanser and a light hydrating oil and moisturiser, and then treat the skin with a treatment that specifically targets any skin issues you're having. This past week, my make-up has been sitting rather patchy and has been clinging to weird dry patches, so the other night I used my REN Wake Wonderful Night Time Treatment which works overnight to 'eat away' at any dead skin cells and reveal radiant, smooth skin in the morning. I kid you not, any dry patches were totally gone the next day so I really must start using this more! If you've been following this series, you know what's coming. Yes, the dreaded S word. Sugar. I tried. I tried so, so hard to avoid it but I don't know what happened! I think I realised how well I had been doing going 'sugar free' and so I thought one tiny sweet treat wouldn't hurt. It's so frustrating! Whilst going cold turkey worked temporarily, I really need to try and do things gradually and not beat myself up so much if I do slip. Obviously, my sugar intake hasn't been horrendous but there have been one too many sweet treats I believe. Since British Strawberries are finally back in season, I've been enjoying munching on a bowl in the evening or as a mid afternoon snack - they really are nature's candy! One thing I've been trying over the last month or so is Skinade*. 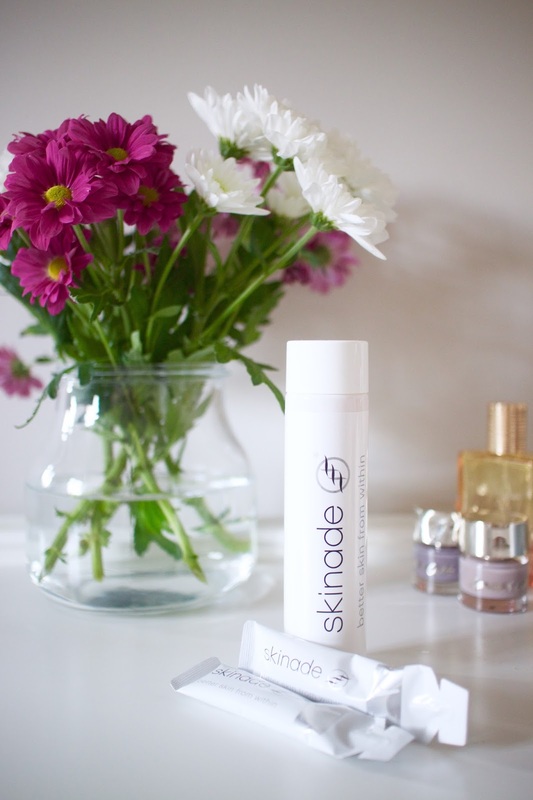 Skinade is a collagen infused drink that I was very generously sent a sample of to discover the wonders of and to see if it made a difference to my skin. In my post on The Beauty Benefits Of Collagen, I mentioned that I wasn't sure why a 20-something young woman needed to even think about collagen. However having tried Skinade, I can really see the benefits. Ok, so my skin isn't flawless but the extra boost has added a glow and plumpness to my skin. Admittedly I haven't been drinking it every single day, more every few days with one day off. The extra collagen has worked to repair my skins elasticity when sugar has taken a hit or I haven't had enough water. My skin's had a few iffy moments this month but i've really noticed it hasn't been as bad as it sometimes can be, which I think is due to Skinade. One thing I'd recommend is pouring the drink into a glass (add ice or chill the bottle in the fridge) if you can, it makes the peachy drink taste so much more refreshing! The reason I have this 'Diet' chapter in The Skin Diaries is because I really believe beauty and good skin comes from within, and the addition of Skinade really proves this. Fortunately I've stuck to my goal of having a tall glass of water every morning before I drink or eat anything else which has really helped. However my overall water intake has dipped due to my water bottle becoming a drippy, leaking useless thing! If anyone can recommend a good, large and portable bottle, let me know! My skin wants all the water all the time right now. I've been going to the gym for 'solo' workouts this month finally, and oh my, have I been working up a real sweat. I end each workout with my face bright red and my hair a sweaty mess which has never happened, even in my previous phase of being a gym bunny which says a lot I think. Again, I don't feel I've seen enough from exercise yet but all the blood rushing to my head and my face is surely a good thing as it's encouraging more blood circulation, which means cell turnover which means healthy, glowing skin, yeah? Life has just been one massive eat, work, sleep, repeat lately though I did see a really stressful period at the beginning of last month which did not help at all with my skin. Stress and sugar are my skin's worst enemies! However, I've had two nice chilled out moments this month when I took a trip home to see my Mum, brother and dog and also when I went to London at the weekend. Sometimes, escaping from every day life is all you need to totally reset and 'detox' your life, skin included! I will say though when I was in London, I could feel the heat and pollution seriously getting to my skin so a much needed detox when I got home was needed! My skin absolutely loved the Aesop Parsley Seed Facial Cleansing Masque which just drew everything out all the while nourishing my skin. Big thumbs up. How has your skin been behaving this month? Are you finding the warmer weather is having an effect? Have you ever tried or heard of Skinade? What do you think about beauty drinks?